If you or members of your family participated in soccer leagues growing up, you know the scene: hundreds of kids of varying skill-sets and levels playing soccer across a half dozen fields. It's a sport that has risen in popularity among children in the United States over the last two decades, which has prompted parents, park districts, and others to organize and run seasonal soccer leagues. 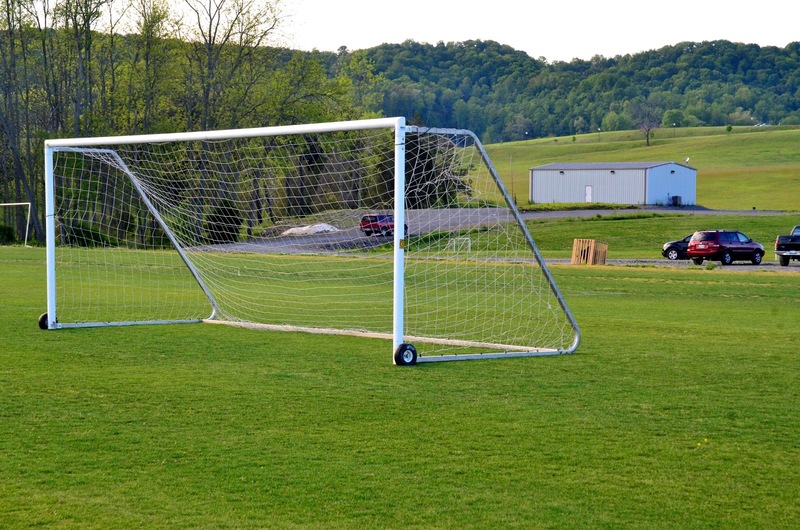 Most of the time, the day’s worth of soccer games happens without a hitch. But there is a challenge for those in charge of managing these leagues. 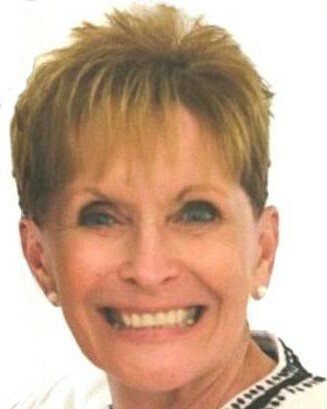 How do you communicate with so many people spread across such a great distance at a moment's notice? Click the "read more" button below for the answer. The answer is simple. Use the AmpliVox Radio Hailer. We designed the Radio Hailer to extend your voice farther than you ever could by yourself or with a traditional megaphone. The Radio Hailer uses apair of 2-way radios (optionally included if you prefer to use your own) that act as the receiver and transmitter for communication. 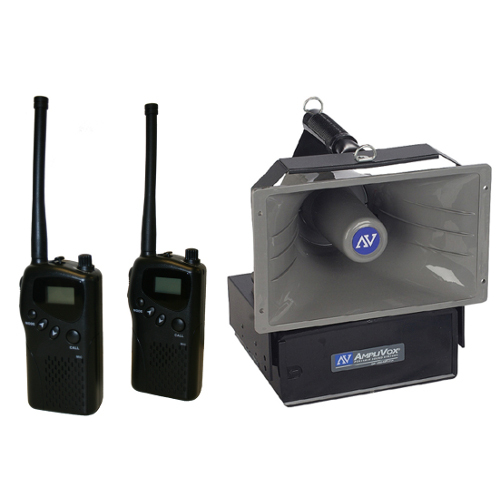 At only 11 lbs., the weather resistant horn and 16 channel UHF wireless receiver that comprise the Hailer can be easily transported using a shoulder strap (included) or can be mounted to a tripod and positioned anywhere on a field to produce sound up to one mile in distance. The AmpliVox Radio Hailer is offered in three models. The SW6200 is equipped to use your own 2-way radios. The SW6210 model includes two of our MURS 2-way radios. 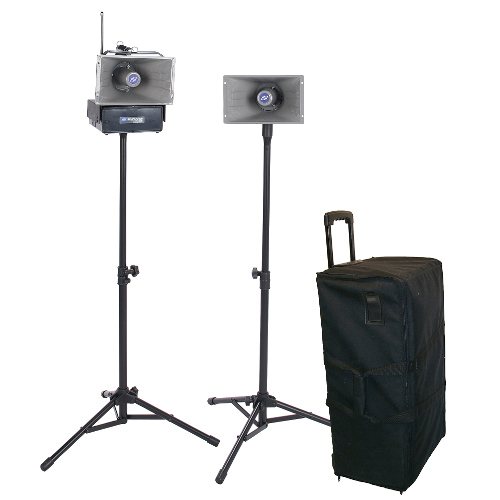 The SW6220 is our “Command and Control Center” model, which includes one additional horn speaker, two adjustable tripods, and a carrying case for easy transport. All models come with a loud 120 dB emergency siren feature and are completely wireless. SW720—The SW720 Wireless PA System is our multimedia sound hub, capable of playing audio from MP3s, CDs, DVDs, and Apple devices like iPhones, iPads, or iPods. In addition to playing media, a wireless handheld microphone allows for clear voice projection, and can amplify sound in a space about the size of one soccer field. The SW720 is the all-in-one solution for multimedia presentations and can easily be carried to and from fields during a busy day of soccer. 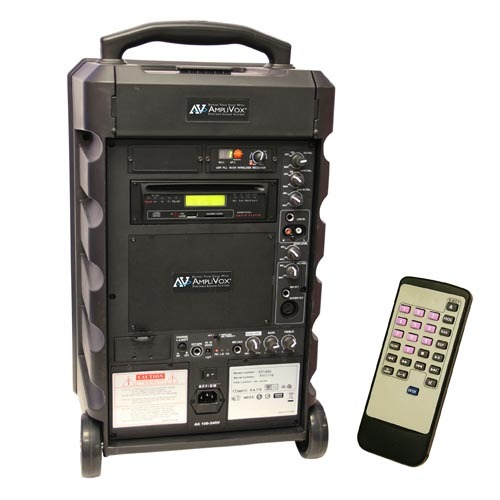 SW800—The SW800 Titan Wireless Portable PA System is a 100 Watt sound system that comes equipped with a built-in 16 channel UHF receiver, a CD/MP3 disc player, a USB port, and more. The device’s name speaks to its powerful sound (it can cover an area about the size of two soccer fields), but not its size; with a wireless microphone, a rechargeable battery, a luggage handle, and wheels, the Titan can be moved wherever and whenever you need to travel with sound. 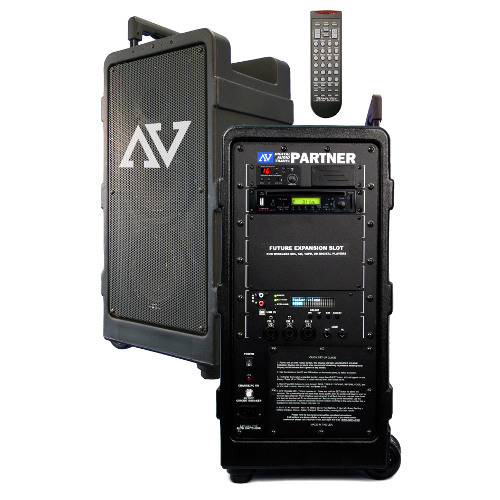 SW915—The SW915 Digital AudioTravel Partner is a comprehensive portable PA system with enough power to reach audiences of up to 7,500 people indoors and cover as many as three soccer fields with sound. It includes a 16 channel UHF internal wireless receiver, a CD/RW MP3 disc player and USB input. What’s more, by selecting your choice of microphone (handheld, headset, or lapel and transmitter), you’ll be assured the device is tailored to your specific comfort and use. In soccer, players are always on the move. If you have run a soccer league, you know the same applies to you as well. In the event of an emergency, or for the sake of time, you need to be able to communicate with everyone quickly. 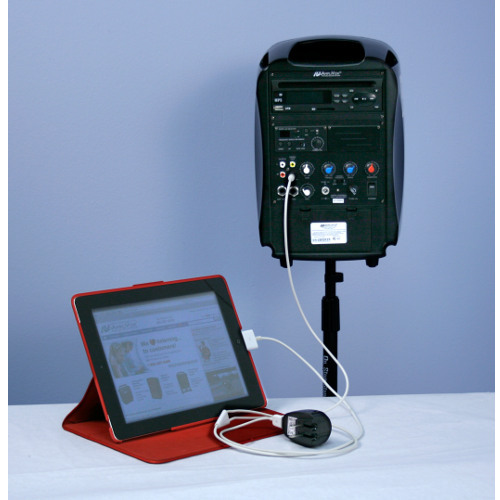 The portable audio solutions from AmpliVox will help you do just that.